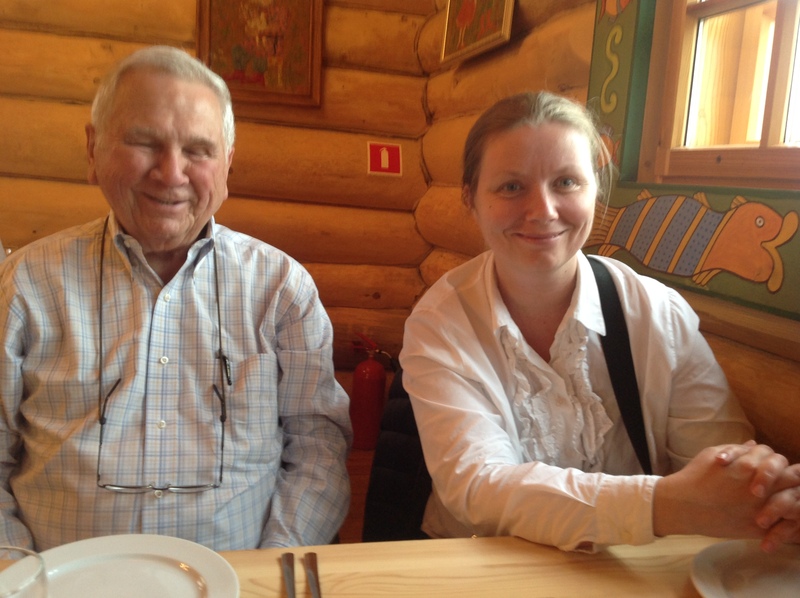 Monday, May 12 (continued)– After the Church of the Spilt Blood, Tatiana settled us into our car and drove us to a little cafe for tea and snacks. It felt good to sit down with a nice hot cup while we rested our feet. Meanwhile, it had started to rain outside. 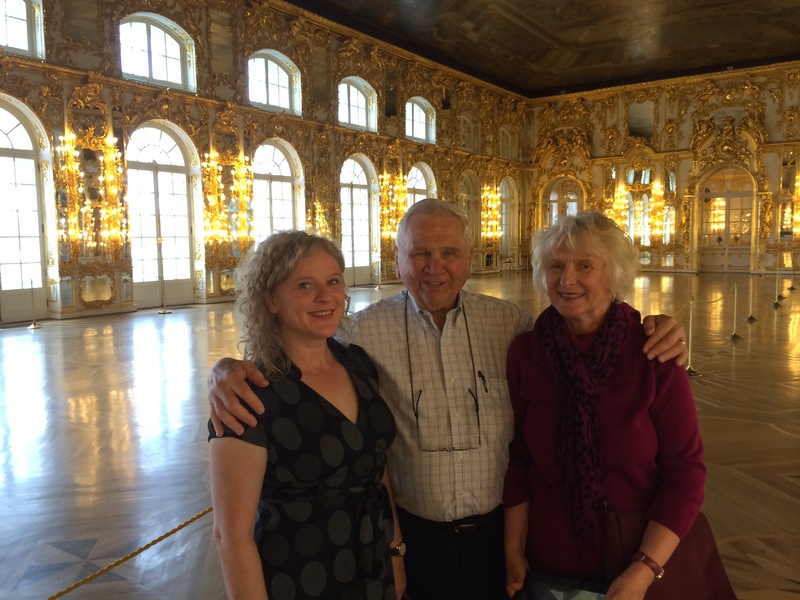 We made a mad dash back to Tatiana’s car to avoid getting wet and set off on the highway toward Tsarskoe Selo, the little suburban town that is home to Catherine’s palace. A little Russian history. Russia has always had a bit of an identity crisis; is it a Western country or is it part of the East? 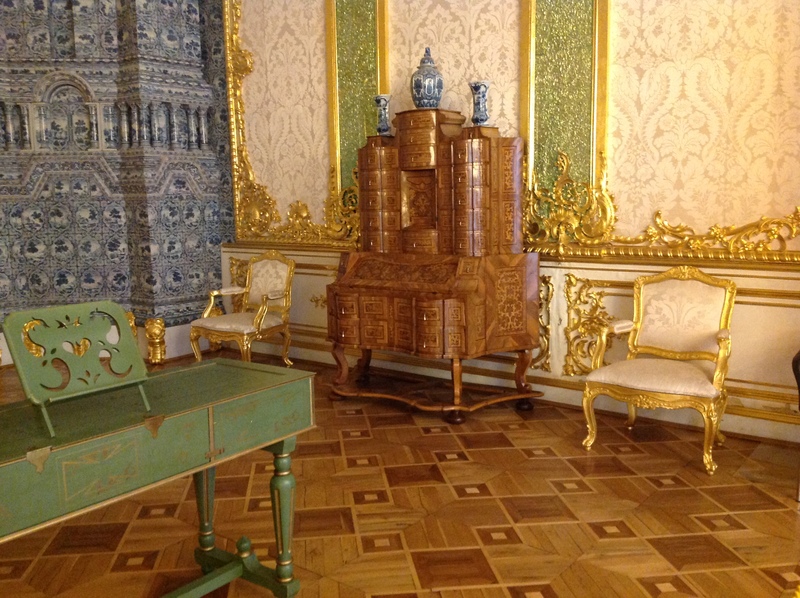 In the 1700s it was hard to see Russia as European since the Renaissance had passed it by. 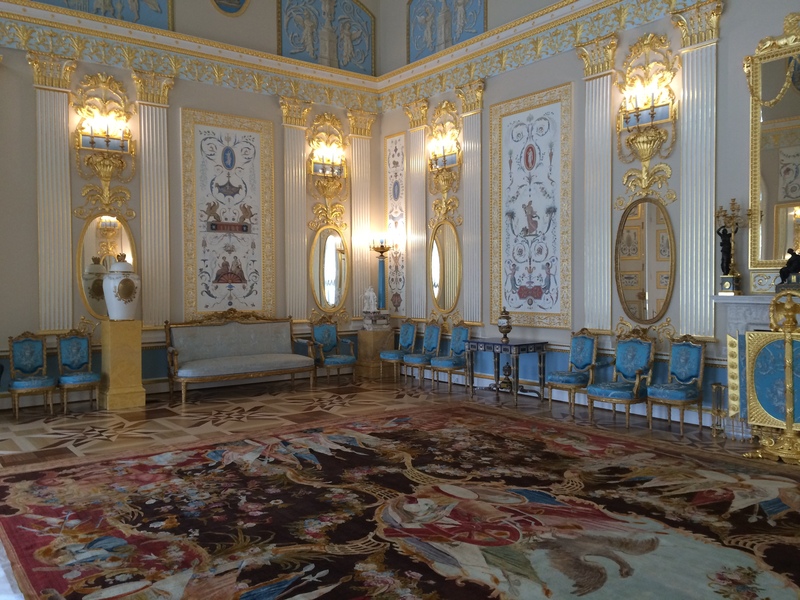 While Europe was reveling in the Enlightenment, Russia was stuck in a clunky Feudal society. That all changed when Peter the Great assumed the throne. Peter was basically a one-man Renaissance and dragged Russia into the modern age. 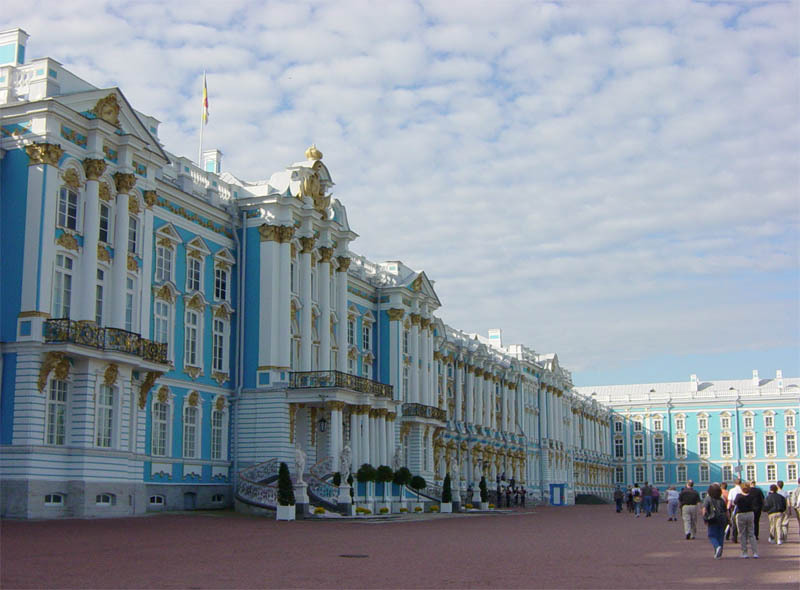 His wife, Catherine, had this palace built as her summer residence. We don’t have any great shots of the outside of the palace because it was so rainy the day we visited. So, in what has become a tradition on this blog, I’ve stolen one from someone else. Catherine I built a summer residence on this spot, but her daughter Elizabeth had it torn down and built this enormous palace instead. So the facade you see here was built under Elizabeth. Actually, that’s not really true, either. 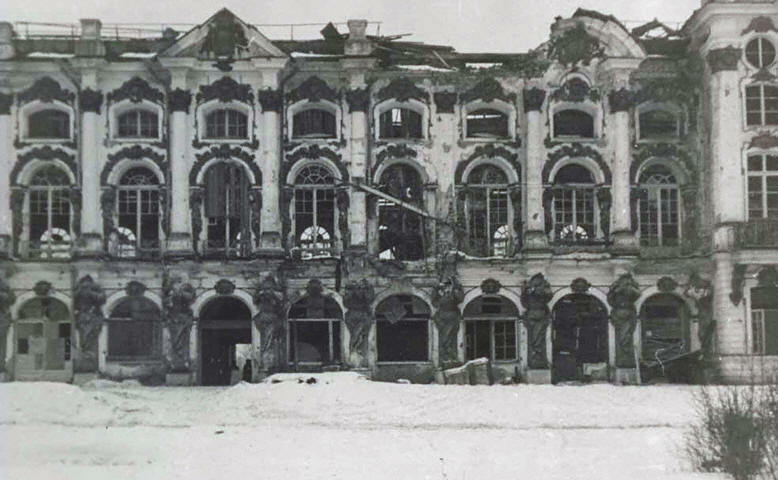 The palace was nearly razed by the Nazis. So what we saw was the restored facade of Elizabeth’s version. 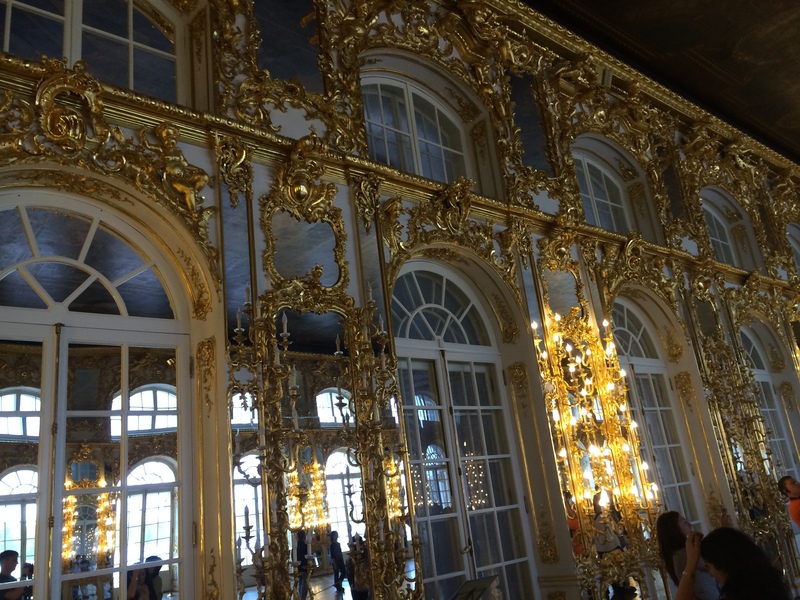 The first room we entered was the magnificent grand ballroom. After Elizabeth’s death, Catherine the Great ascended the throne (well, it’s a little bit more complicated than that but for our purposes I’m skipping over the complications). 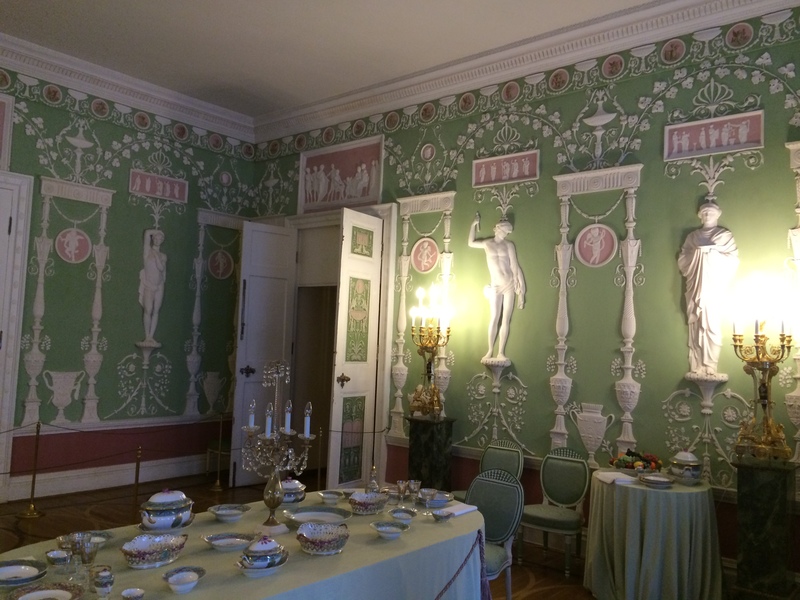 Catherine thought Elizabeth’s version of the palace was hideously vulgar, so she had a lot of the wild flourishes removed and redecorated a wing of the palace in more classical style. 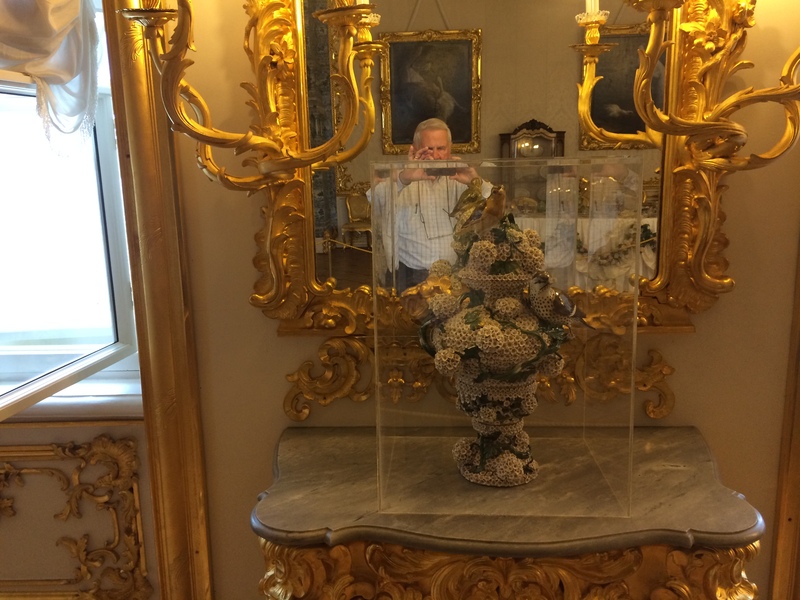 Here’s Dad admiring the Imperial Porcelain from the 18th century. Behind him you can see the grandeur of the White State Dining Room. 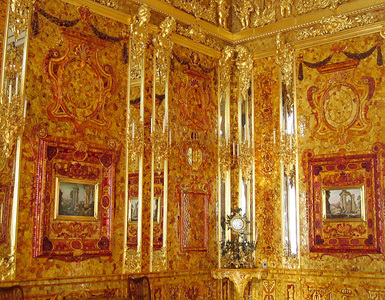 This is one of Elizabeth’s over-the-top rooms. 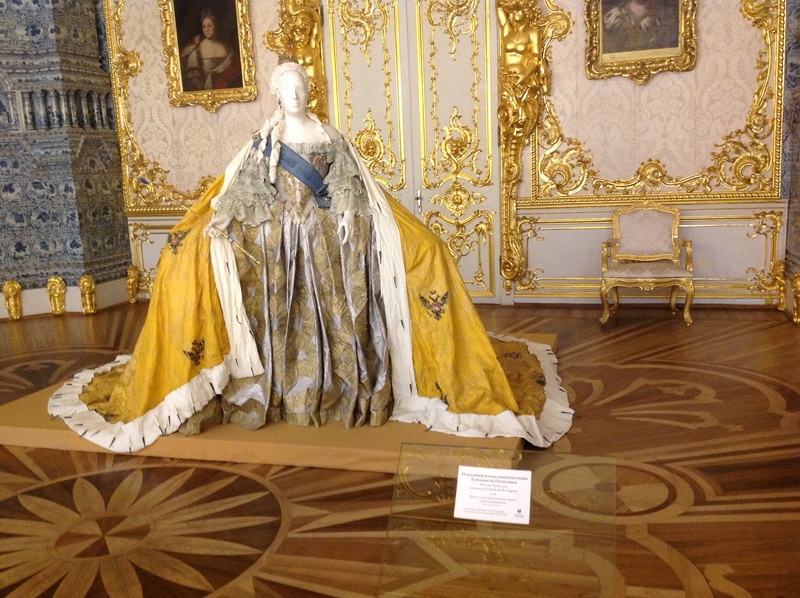 Catherine the Great, as I mentioned, wasn’t too keen on all this fussiness. She used the above room as a pantry. 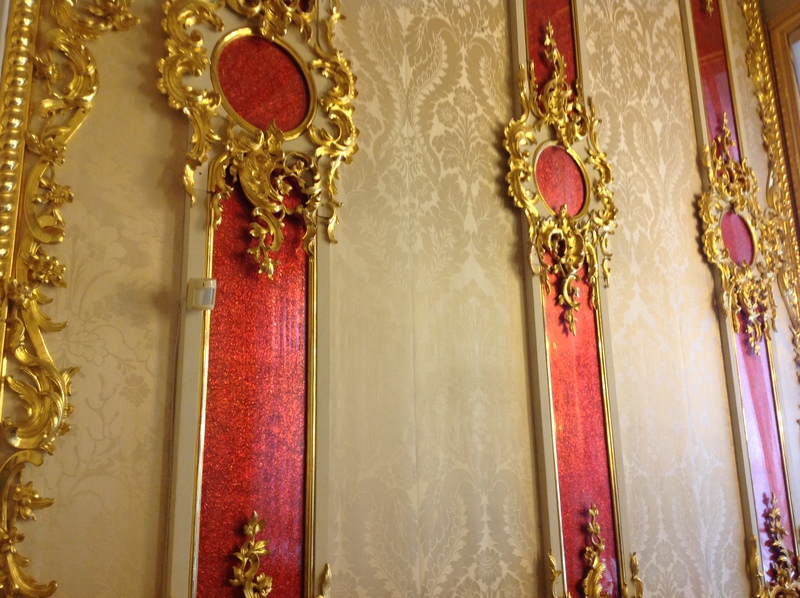 After WWII, the restorers decided to recreate the room as it was under Elizabeth. We also saw one room that has been destroyed not once but twice. 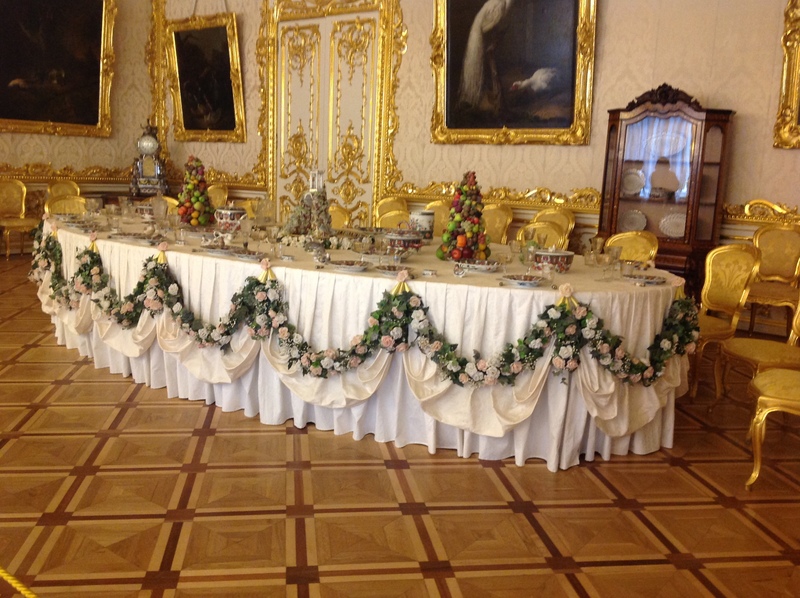 The Green dining room was destroyed by a fire during the time of Alexander I. He had it restored using the original architect’s drawings. Then, the Nazis, of course. You know the story by now. We had hoped to tour the gardens after the palace, but rain prevented that. And, believe me, I think we were all a bit relieved. We’d been going non-stop since around 9am. Tatiana brought the car around and drove us to one of the few restaurants in Tsarskoe Selo, the restaurant at which Vladimir Putin (known hereafter as VVP), had his birthday one year. 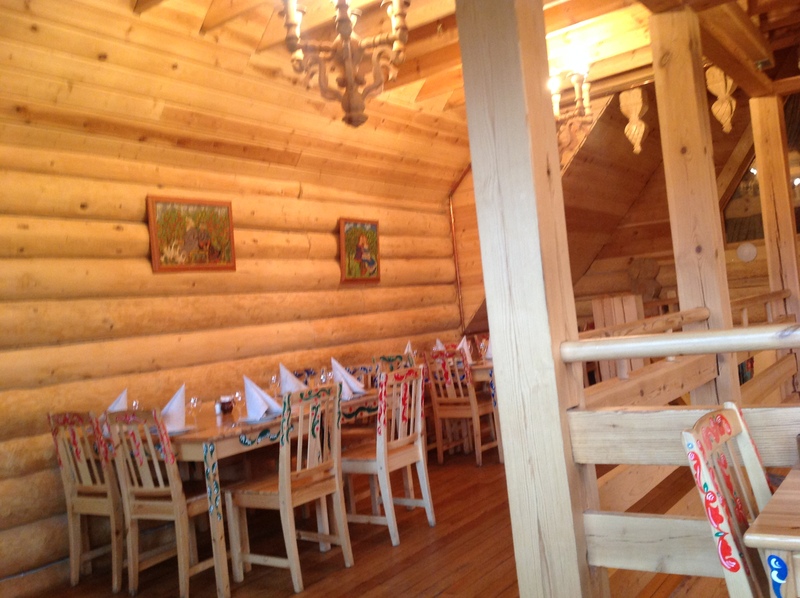 The interior of the restaurant aimed to recreate a Russian izba, or wooden house. We had the tasting menu for dinner, which came with vodka and red and white wine (which seemed odd to me, but whatever). The meal started with cold meat platters, marinated vegetables, and tomatoes stuffed with cheese. The rest of the meal (borscht, mushroom julienne, stuffed cabbage leaves), was good, but I was most impressed with the cold starters. I adore pickled garlic shoots and these was particularly delicious. I have to admit, we had a little too much to drink. But, if there’s a country where it’s generally acceptable to have too much to drink, it’s Russia. We happily settled in for the relaxing ride back to the hotel and made our arrangements to meet the next day. Thoroughly walked, fed, and drunk, we tumbled into bed.